in Microsoft Word. Observe the incorrect use of the double integral sign where a triple integral sign is required. How to correct this? 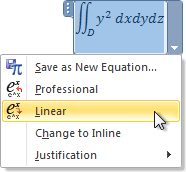 It would have been nice to right click the “large operator” (as it is called in Microsoft Word), point at the “Change operator” submenu and select the triple integral sign from a gallery. Unfortunately, such a submenu doesn’t exist in Microsoft Word (at least not in Microsoft Word 2010). The obvious workaround is to write a new integral from scratch, possibly copy-pasting the integrand and zero, one, or two indices. That is somewhat awkward.